The story behind this beer is that it was originally the Stone 11th anniversary ale but everyone loved to so much they brought it back year round. This is also the newest of the Stone year-round beers. I’m not sure if this has crazy head or if I chose the wrong glass or poured to hard. But this is a thick brown head topping off ff a completely black beer. 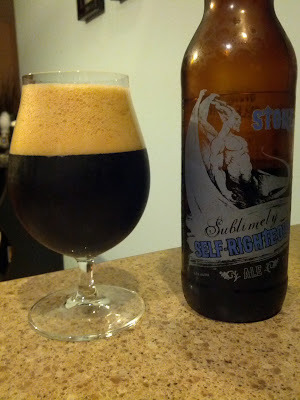 This is darker than the Stone Smoked Porter (my review here) by far. That head dropped off entirely very quickly leaving only hints of lacing. I’m getting a tasty smell with lots of earthy hops. That hop aroma blends nicely, and over powers slightly, the roasted/burnt malts which make this a IPA black. The taste is simply fantastic. Great roasted bready malt character with plenty of hop flavor and only a peek of bitterness. Which sorta surprises me coming from Stone. Ultra lusciously smooth and creamy mouth feel with medium body. This has been my favorite beer that Stone hooked me up with by a long shot. Everything else was okay but this is awesome. I love the smooth subtly and the high strength. I will definitely be buying this frequently… When I’m not trying new beer all the time. Next Next post: What is Local? What is Craft?